In a previous post, I described the process of obtaining a Microsoft key to use for Windows Store apps that are sideloaded (not obtained or installed via the store). 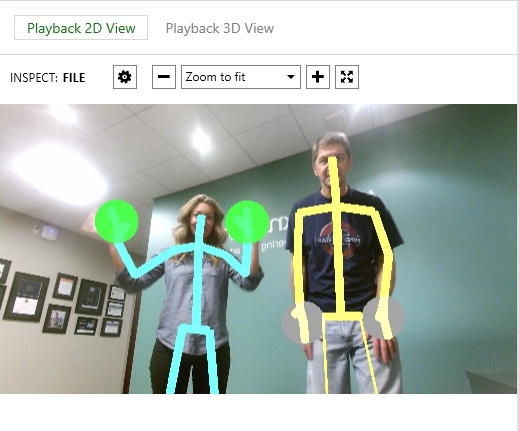 We have taken this approach most recently with the “Magic Wall” software that we built for CNN. Now that you have the key, let’s configure a machine with that key to install and run the sideloaded application. I was surprised to see that there is nothing to do to the application itself to enable it for sideloading. You don’t embed your key in the app – it’s completely stand-alone. This kind of makes sense and has a huge benefit of allowing you to use the same sideloading key for any application, even if it wasn’t originally intended to be sideloaded. You DO still have to sign your application with a code-signing certificate. Let’s take care of that first. In your WinRT application project manifest, Packaging tab, use the button to “Choose Certificate…”. Point to your code signing cert, provide your password, and you’re good. The appx is still not signed, it’s just built with the certificate. Now let’s sign it. Open a command prompt with administrative privileges, and run the following command, providing the path to the certificate and the certificate password. Next you have to configure the machine where you want to sideload the application. You only have to do this once for each machine, and then you can sideload any applications on it. Again, the key is not tied to the application. You can easily find this info online, but here it is again for reference. The command below installs the sideloading key on the machine. Use the key that you got from the Volume License Center key manager. You should see a success message when it completes. Then run the next command, which “activates” the sideloading key. 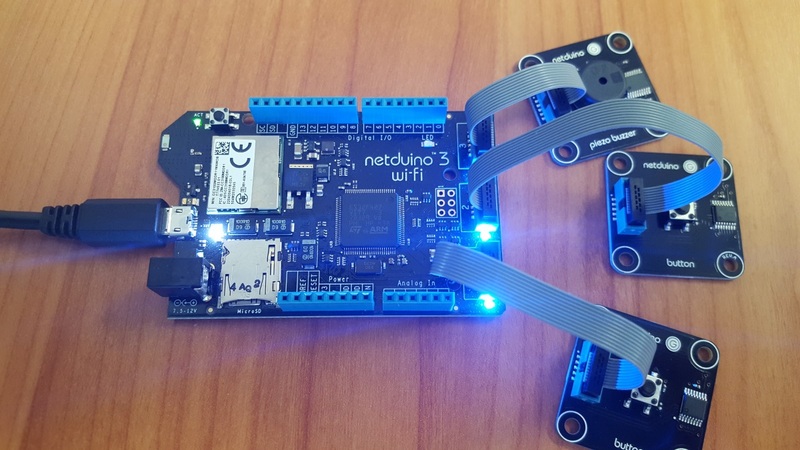 You must be connected to the internet to run this command, as it will connect with the Microsoft licensing servers to verify the key. Unlike the GUID above, the GUID used below is not specific to your sideloading key. Everyone should use this same GUID. You should see a success message when it completes. Next, a simple registry entry allows the OS to install trusted applications (those that are signed). Add the following key and value to the registry. You should add the “Appx” key if it doesn’t already exist. Finally, you install the application using PowerShell. Copy the .appx and .appxsym to the target machine where you have enabled sideloading from above. From a PowerShell command prompt, use the following command. Now you can find the installed application on the start screen list of all apps, or through search. Pin it to the start screen or run it from there. That’s it. Hope that works for you. Back in April, Microsoft announced that it was making it much easier to obtain a sideloading key for deploying “internal” line of business Windows Store applications. Until then, it was ridiculously prohibitive to acquire a key, so the sideloading story was crippled. The above link (and this one) has the details, but suffice it to say that you are now able to get a sideloading key for $100. Sounds easy, right? I set out to buy a key for us to use at InterKnowlogy, but … I searched high and low for information on WHERE to buy such a key. We get our volume licensing via our Microsoft Gold Partnership, and that’s not one of the qualifying methods for already having a sideloading key. WHERE can I buy the key? After many calls, I find that the Microsoft Volume License Service Center does not sell it, but instead recommends a volume license re-seller. (I’m not trying to buy a volume license, just a single license for unlimited sideloading.) I assume there are lots of volume license re-sellers, but that I ended up with was Software House International (SHI). LONG story short: this key is being offered as part of the Open License Program, which allows you to setup an account even though you haven’t or won’t be buying LOTS of (volume) licenses. Setup the account, purchase the “Windows Sideloading Rights” license (QTY 1), part #4UN-00005. No good. You must buy at least 5 items to qualify for a “volume license”. WHAT? I only need a single license, that gives me UNLIMITED sideloads. Why would I need more than one? The fix (salesman’s idea): find the cheapest thing in their catalog and buy 4 of them: “Microsoft DVD Playback Pack for Windows Vista Business” (QTY 4). $4.50 each!! Make the purchase, $111.58, and now I have some sweet DVD playback software to give away to developers as prizes! 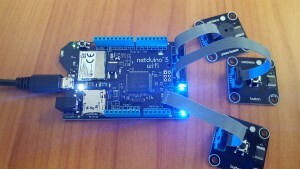 Download the key, and next blog post, I’ll show you how to use the key to sideload. Really cool that Microsoft made it cheap to get a sideloading license, but the mechanics of the process (at least to purchase) are still pretty wonky. 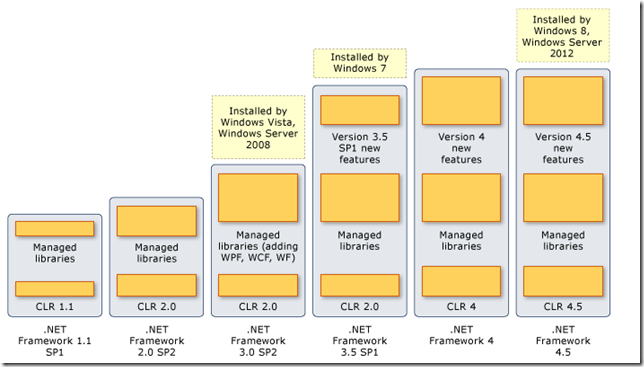 We are looking into using the Microsoft’s hosted Team Foundation Service, and the first question that always comes up is “I have an existing TFS project, how do I get my source (and work items) up there as a starting point?” So I decided to look into it, and found the TFS Integration Platform written by the ALM Rangers at Microsoft. MSDN Magazine has a good article to use for background and to get you started, but I had to do some custom tweaks to get mine to work. First off – let’s set the goal: migrate source code (including history) and Work Items from an on-premise TFS to the Microsoft hosted TFS. I’m starting with a brand new Team Project in the hosted TFS, so if you merge code into an existing project or branch, your mileage may vary. Second – we use a custom process template (modified from SCRUM) here at IK, and we are going to use the Agile process template online, so that adds a little complexity to the migration, as I have to map fields from the local process template to the hosted one. 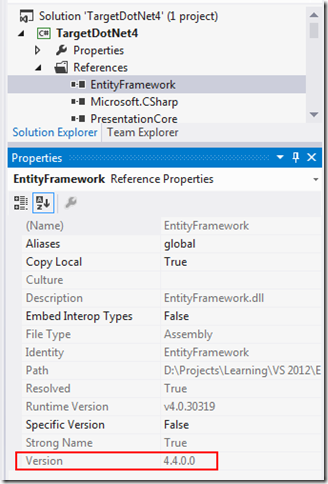 Create a work item query in the source TFS that includes the work items you want to migrate. In my case, I have SPRINT types in the local TFS, but those don’t exist in the destination Agile process template, so my query includes only Product Backlog Items (that we’ll map to User Stories), Tasks, and Bugs. Fire up the tool, and click Create New. 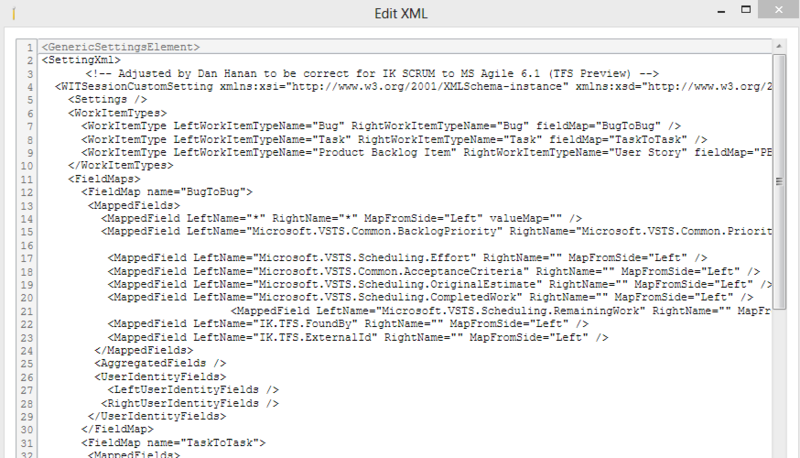 Select the “Team Foundation Server\VersionControlAndWorkItemTracking.xml” template. This gives you all the configuration settings you need for migrating both source control and work items. 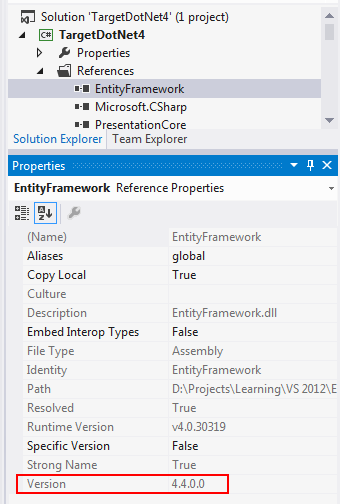 Configure the source (left side) and destination (right side) connection information for each of Version Control and Work Item Tracking. I used VS 11 (TFS 2012) for both my local and hosted TFS connections. By default, the source control session will migrate from the root of the source tree in the local repository to the root of the source tree in the remote one. This caused a bunch of conflict errors for me, since even the newly created Team Project in the hosted TFS has some build template files in the BuildProcessTemplates folder. Since the source and the destination both have the same files, there are conflicts during the merge. You can work around them by specifying which version to use, but I avoid the hassle by filtering the source that’s migrated to a sibling tree that does not include the BuildProcessTemplates folder. The tool seems to provide a way to cloak a directory such as the BuildProcessTemplates folder, but I could not get that to work. 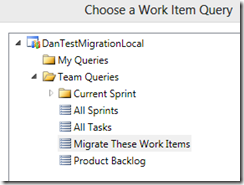 Now we’re going to limit the migration to only the work items that are returned by the query we created above. 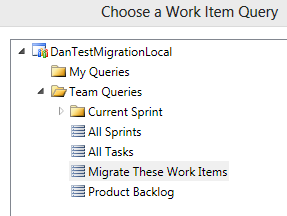 Click the “…” button next to the edit box in the “Queries” section and navigate to the query, mine is called “Migrate these Work Items” (again, it only includes Product Backlog Items, Tasks, and Bugs; not Sprints). 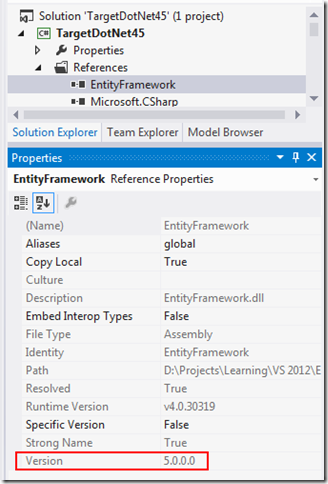 Notice when you come back from choosing the query, the actual CONTENT of the query is inserted into the edit box, instead of just a reference to the query. I thought that was kind of interesting. Finally, as I described above, I have to do some custom mappings to get the work items from our custom SCRUM template to the hosted TFS Agile template (we want to use some fields that are in Agile and not in Scrum in the hosted TFS, and process templates can’t be customized yet). 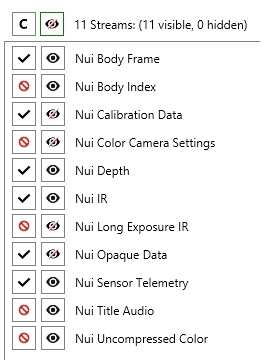 Here is a zip that contains the settings I used. You can use it as a starting point and then adjust as needed. There is a section at the bottom that attempts to map users from the source to destination TFS systems, but I couldn’t get that to work either. That’s it – SAVE and START. Watch the progress, and check for any conflicts. If you get some, you’ll have to resolve each issue independently. It looks like the tool does a bunch of analysis and validation first, and will only proceed to the actual migration when there are no conflicts. 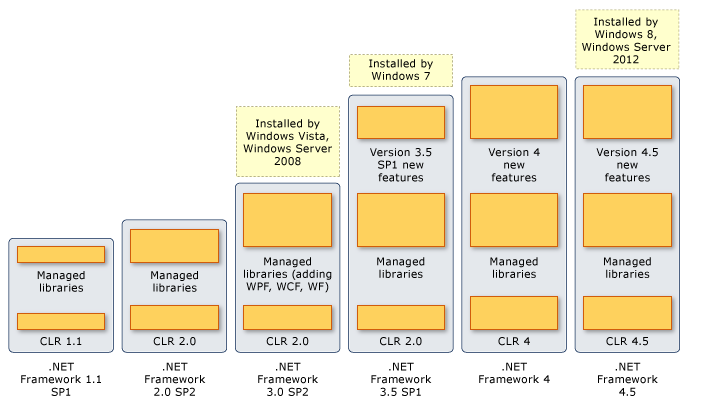 I have written before about being part of the Snoop team – contributing to the open source code base for the WPF spying utility. In the past couple months, we gained some good momentum on some cool new features, and now we are proud to announce the availability of the next release: Snoop 2.8.0. Special shout out to Cory Plotts for all his work in getting this release out. Here is a rundown of some of the new features in the new version. My coworkers and I often times end up using Snoop as a kind of “run-time designer”. Blend can only go so far to show us the run-time look of a given view or control, so we Snoop into our running application and make changes to various properties (font sizes, margins, alignments, etc). 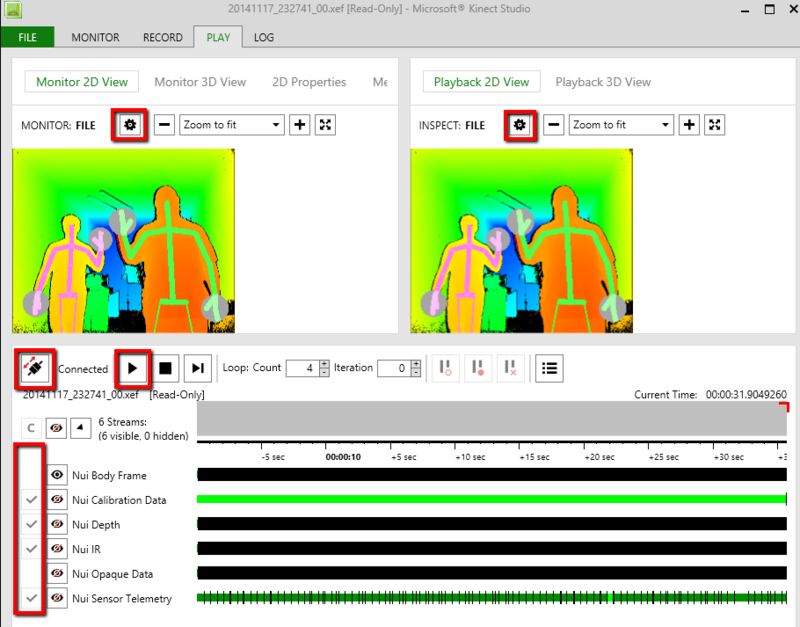 We make these changes interactively, deciding what looks good, and then have to adjust the XAML code accordingly. If you’ve made changes to more than a couple properties, it’s easy to forget what all the changes were. This feature will save you. 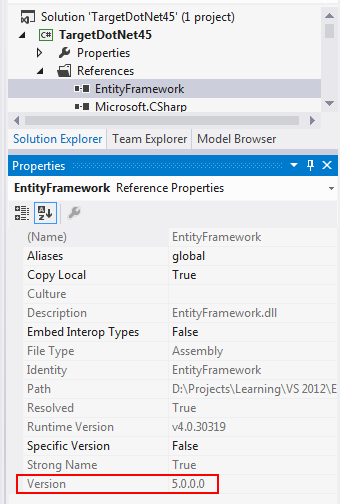 The output is organized in a hierarchy, listing each object that contains at least one property that was changed, and then grouping all the changed properties on that object together. The identifier for the object matches how it’s displayed in the Snoop visual tree UI. I’m not a huge PowerShell user, but I can already tell this contribution from Bailey Ling is a killer new feature. 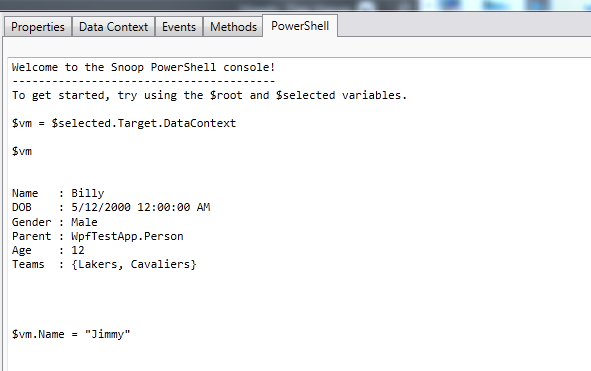 There is a new PowerShell tab in the Snoop window that lets you party on your objects, using PowerShell commands. The most basic commands that I know are to set a variable that points to the DataContext of one of your elements, then start making calls to properties and methods in that object graph. Check out Bailey’s introduction to the concept in his two blog posts. One and Two. ESC key now clears any current search filter. 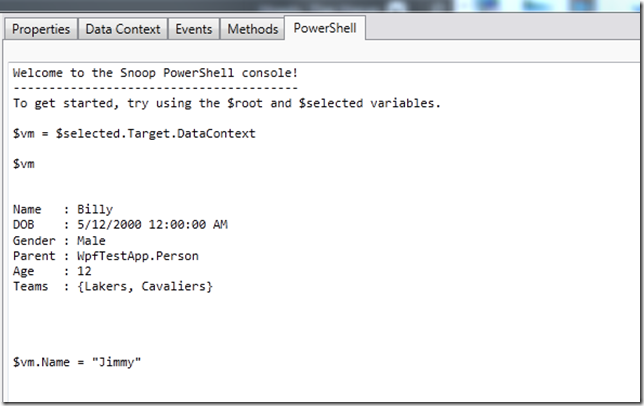 If Snoop throws an exception from within itself, we catch it and don’t blow up your app.